Donnington is a small village and civil parish in the Chichester district of West Sussex, England. The village lies on the B2201 road, two miles (3 km) south of Chichester. The northern part of the parish comprises the Stockbridge area of the City of Chichester. The village lies on the Chichester Canal. The parish is also home to the Sussex Falconry Centre. An electoral ward of the same name exists. This ward includes Appledram, and at the 2011 census had a population of 2,228. ^ "Civil parish population 2011". Retrieved 15 October 2015. ^ "Ward population 2011". Retrieved 15 October 2015. 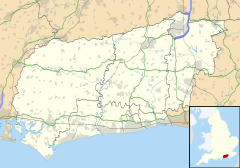 Wikimedia Commons has media related to Donnington, West Sussex. This page was last edited on 24 February 2018, at 17:18 (UTC).